12:15 – 1:00 p.m. OR 5:15 – 6:00 p.m.
You probably know someone who has said, "I'd love to learn to quilt but I don't know if I can." Well, direct them to a FREE 45-minute demo session so that they can see how easy it really is to measure, cut, and piece a quilt block together. 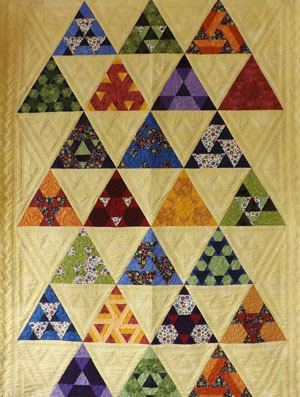 Participants will learn many tips and tricks about how to create a beautiful quilt. No RSVP necessary . . . just show up at Cortez Quilt Company, 40 West Main in Cortez at either 12:15 or 5:15 p.m. on Wednesday, November 6. Third Thursday Demo – Thursday, November 21, 12:30 p.m.
Get your 2014 CAD card when you spend $25! This is a repeat from last year because CAD cards were a hit. 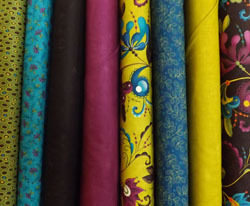 With your CAD card, once a month you get one yard of fabric free when you buy three at regular price. New fabric has arrived and more is on the way! Love Kansas Troubles? 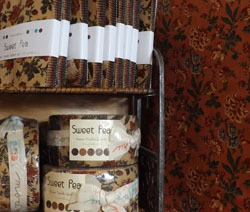 Their newest collection - Sweet Pea - arrived yesterday, complete the jelly rolls and charm packs. Can't you see a Charm Party Tote bag made from one of these charm packs? 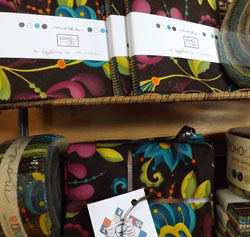 This beautiful collection, also from MODA, has jelly rolls and charm packs available, too! The rich, dark chocolate background in this collection is beautiful. There is still room in the two class we have scheduled for this Friday and Saturday, and many more are slated through the end of the year. Sign up today and enjoy hours of sewing away from the distractions of home! 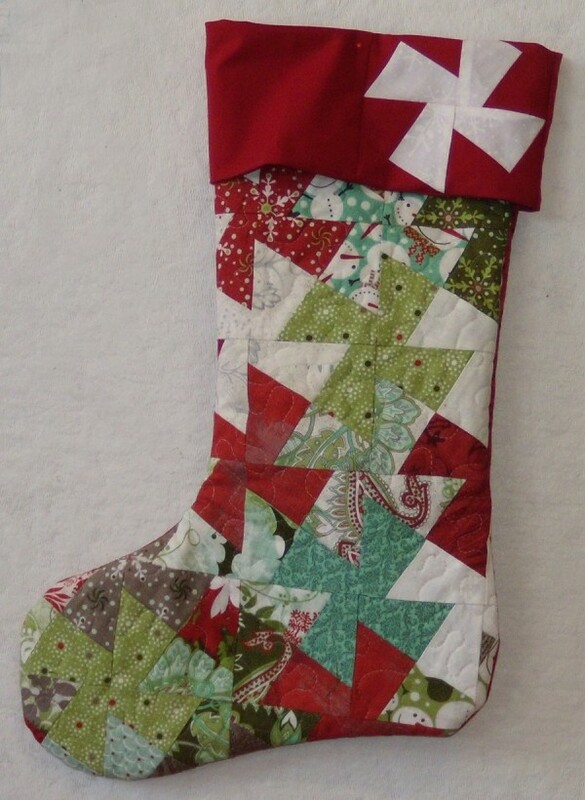 You have plenty of time to make one of these darling stockings for every member of the family. Using the Lil’ Twister tool this holiday favorite can easily be made in a day. Start with a charm pack or your own assortment of 5-inch squares. Cindy Dahl will teach this class. Kits are available. We've added new classes to the schedule. Thank You Grayson Country Quilters! We were delighted to have you all visit our shop on October 16. It was nice to see so many familiar and new faces. We hope you enjoyed your road trip over to Cortez! We’re now offering Class by Request – CBR for short. For four or more students, we’ll give classes in anything we usually teach on any day we don’t already have a class scheduled. CBR is ideal if you want to spend a day with friends (perhaps on a friend’s birthday?) sewing and learning something new. Regular class fees apply. Please call at least a couple of weeks in advance to schedule your private party! Coming in January . . .
SIX First Fridays: January 3, February 7, March 7, April 4, May 2, June 6. This series is FREE with purchase of book, ruler, and fabric. Toes in the Sand uses the new, popular Hex N More ruler and we’re structuring a class for early 2014 sort of like a block of the month. The class will meet on the first Friday of each month for six months and during each session you’ll make two different blocks (two of each). 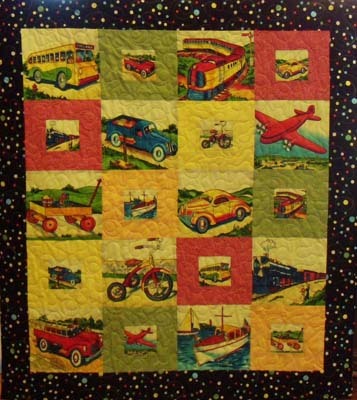 At the end of the six months, you’ll have all of the blocks you need to assemble a beautiful 64″ x 84″ quilt that, depending on the fabrics you choose, can have either a traditional, modern, or elegant look. This class is already filling up, so sign up soon! Cindy Dahl is the instructor. If you have a CAD card (Customer Appreciation Day card) don't forget to use it each month to get one free yard of fabric when you buy three. Ask for a10% discount on your birthday! November 2 is First Saturday. Bring in those beautiful red and white blocks, ladies. The final installment of Mystery Quilt will be available on Friday, November 1, along with an invitation to a special "reveal" event in February. Don't forget that you can now purchase gift certificates online, along with kits and finished quilts. Visit www.cortezquiltcompany.com 24/7/365. This popular kit is once again available. Designed by our very own Cyndi Foote, the finished size is 40" x 44" . . . perfect for your favorite baby or toddler. The kit includes everything you need to make the quilt including the pattern and backing fabric for only $58. Buy online or come by the shop before we run out these again! 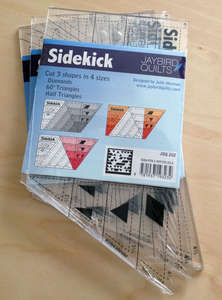 Check out the new Sidekick ruler that cuts diamonds, 60 degree triangles, and half triangles in four different sizes. We have these in stock and they're $19. Phone orders are always welcome! We have this pattern in stock now that uses the Sidekick. It makes a darling little table topper or wall hanging. This brand new pattern that also calls for the Sidekick has shipped and should be in the store within a few days. Make this quilt in several different sizes. Beautiful!